Yesterday, a Christmas card I had sent to my friend of thirty years, Debbie Dixon, came back. A cursory line hand-written on the back, perhaps by the person who lives in her house now, said “I’m sorry to say Ms. Dixon passed away”. The truly shocking thing was that when I Googled and found her obituary, I learnt that she died three years ago! That explains why I hadn’t had a Christmas card from her for the last few years! I had thought that maybe she was still “pissed” (her word) at me for a brief falling out we’d had a few years ago when I had posted a photo of her on Facebook. She had at the time gone mad! Lecturing me about how once a thing is on the internet it is there forever and how she didn’t want certain people finding her! I apologised and assured her that I wouldn’t EVER post another photo of her! Later she apologised for her over-reaction and further explained her fears about the internet, which as time goes on I come to appreciate much more deeply. She came to visit me in Ireland a few years ago and I gave her a tour of all the things she had on her list! She was a very organised person! 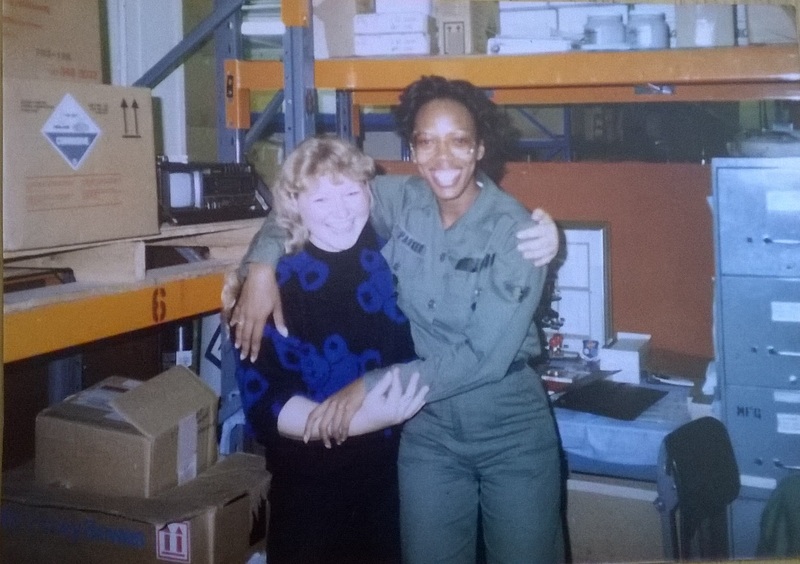 I first knew Debbie when she came to RAF Lakenheath in Suffolk where I was working as a Civil Servant attached to the USAF Hospital in Medical Supply. My job was keypunch operator on a very old-fashioned card punch machine. Before she came, her PCS documents arrived and we all scrutinized them to see who the new Airman Basic was! We found out that she was single but that she had one dependent, a son, PJ; I think he may have been about 3 at the time. I liked her immediately. Her sassy attitude, her way of rolling her huge round eyes, and that way Black American women have of sucking through their teeth! She was awesome. She was such a great friend. She got me in to various shops and bought things for me that I wouldn’t have been entitled to buy with my sterling. I still have a leather-bound, gold-leaf book of World Poetry that she bought me; one of my favourite books. Debbie had a very definite idea of what she expected from a boyfriend or husband. I always felt her expectations were unreasonable, but she stuck to her high standards! Her boyfriend when I worked with her was an adorable young man called Eugene Green. He failed her by not buying her presents! She was contemptuous of his efforts to explain that all the spare cash he earned he sent home to his family. She said he came from “The Projects” which was an expression I did not understand at the time! She liked to lavish her friends with gifts, and I knew her well enough that she expected them back! In later years she started a collection of teapots and I sent her a couple of them including a rather nice antique one from this house which wasn’t really to my tastes. Wherever she was posted to in her military career, she would send me enormous parcels, containing all manner of items; clothes, household goods, food items, it was always like a lucky dip as I rooted through my box of loot! She was a great letter writer. She would write reams and reams. Her writing was quite hard to read until you got into it, as unique as she was. In her letters she would pour out her soul, confiding in me the most private and intimate of things that I believe she would never have been able to say to my face. She told me that she had been raised by her grandmother, (Ethel Purvey). That her own mother was obese and I think a drunk. She may have also been diabetic. She told me that once when she was a small child her mother fell on her and crushed her; her knee driving into her stomach. She caused internal damage. She didn’t think she could have children, but somehow she did have PJ. I asked her about him once and she just said he isn’t in her life. I think she said he was being raised by the father’s mother; PJ’s paternal grandmother. She never mentioned him in later years. 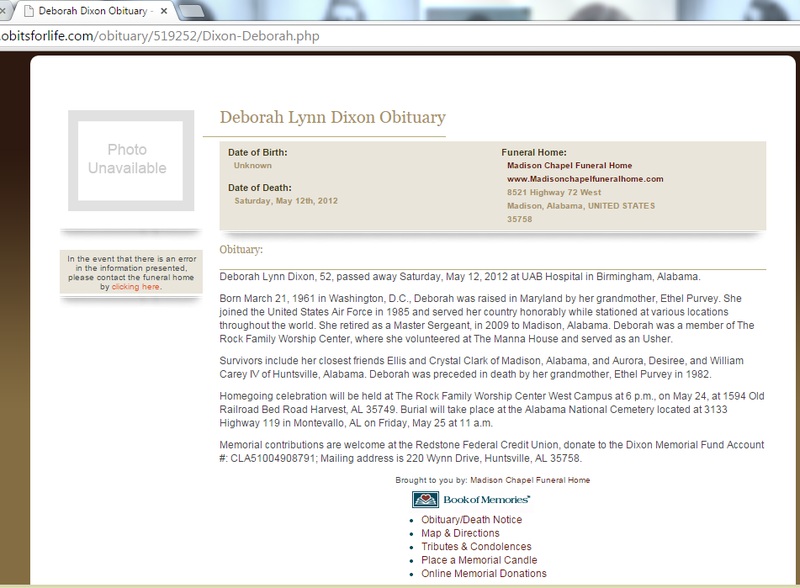 In her obituary, there is mention of friends, and I would dearly love to make contact with any or all of them. Their names are Ellis & Crystal Clark, Madison, Alabama and Aurora, Desiree and William Carey IV, of Huntsville, Alabama. 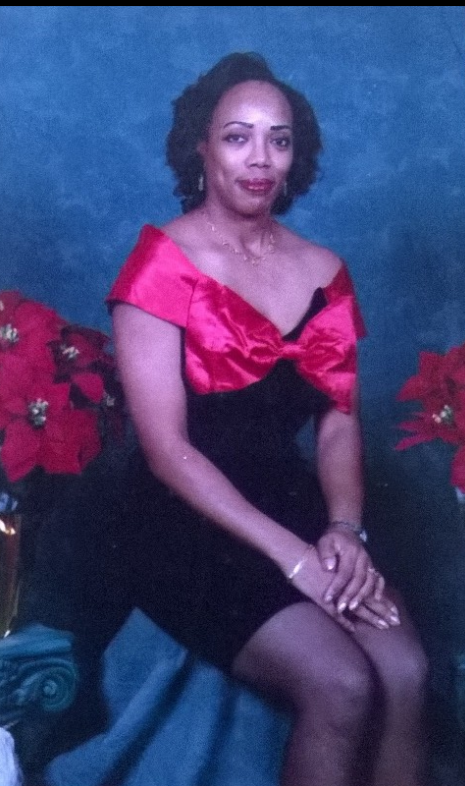 Her funeral was at The Rock Family Worship Centre, West Campus, 1594 Old Railway Bed Road, Harvest , Alabama, 35749, and she is buried at 3133 Highway 119 in Montevallo, Alabama. Debbie was born on 21st March 1961 and died on 12th May 2012. I CANNOT believe I didn’t know she had died, and that I found out in this way. When I first met her, she was called Debbie Parker. Then she got married and became Debbie Gray, then divorced and remarried and became Debbie Wallace (they may be the other way around), and finally she kept the last husband’s name: Dixon. Her last known address was 310 Harvestwood Court, Madison, Alabama, 33758-6637 and her email addresses were hswthme61@hotmail.com and dlj2161@yahoo.com Someone out there must have known her? I wrote this blog as I need some sort of closure! I feel I must speak to someone who knew her, and I would like to know what became of her son, PJ. I can’t remember the last names of the girls she was friends with at Lakenheath, but I know she kept in touch with them for a long time. They were Gloria (very beautiful black girl) Janice (another very attractive black girl) and Bernie (a small-framed red-headed white girl). R.I.P. my very dear and loyal friend Debbie. God bless you my dear. I love and miss you and want to thank you for your faithful friendship for all those years. I’m so sorry I didn’t know sooner. Please forgive me now for once again posting photographs of you online!